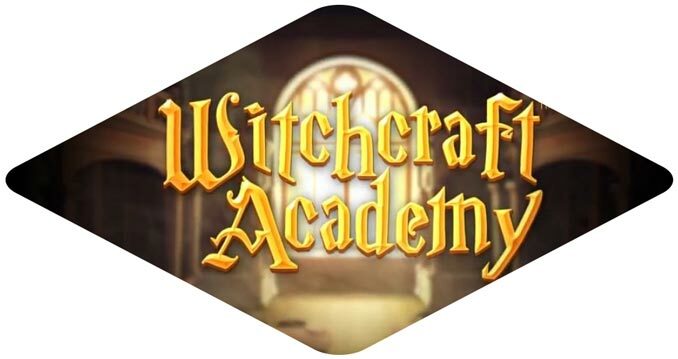 WitchCraft Academy – Fun slot or not? Here is my short review of the NetEnt slot Witchcraft Academy. Of course there are many slots that release in the year 2019 that is very cool. But with the June 2018 release of NetEnt’s Witchcraft Academy comes a spellbinding online slot machine game that can give players thrills and chills. The game is loosely based on the popularity of book and movie franchises. Such as Harry Potter. In fact, both the theme of and soundtrack to the game will seem familiar to fans. Especially of those to the Harry Potter novels. Set against the backdrop of a school library, the reels are transparent. The symbols seen on them use just the right colors to perfectly set the mood. The game is led by a witch named Efora and a wizard named Earthan. These factor prominently into the bonus feature. Aside from the human symbols, others seen on the reels include a magical dragon. There is also a magical owl as well as hearts, spades and clovers. Earthan is the symbol on the reels that holds the most value. Witchcraft Academy bonus, wild and scatter symbols are used to make game play profitable, as they each boast their own functions. The wild symbol, a yellow background with the letters “U” and “S” in red, often becomes an expanding or stacked wild. The bonus symbol is the word “Bonus” in yellow type, set against a purple and gold background. Its only function is to reward players with the Elements bonus, which is activated after three scatter symbols land on the reels within a single spin. When the Elements bonus begins, players are presented with a chess board containing oversized statues and prizes that reward players with free cash, spins or multipliers. They must then choose whether or not they want to play as Earthan or Efora. Whichever one they choose then fires shots at the chess board. Having gotten three of the scatter symbols in order to trigger this bonus, players get three choices. This means that they can choose Efora once and Earthan twice, or vice versa. Each time they choose one or the other, they can shoot at the board three consecutive times. Players that destroy each piece on the game board then have a chance to shoot at the bonus symbols. These are found directly behind them. Bonus symbols add certain features to a player’s free spins. Such as a multiplier or sticky wilds. Free spins begin after a player has shot the chess pieces and their bonus symbols. While free spins are being played, there is always the potential to trigger as many as 20 more of them, if the bonus symbol appears during those free spins. For fans of Harry Potter, Witchcraft Academy is a real treat. However, due to the unique aspects of the bonus game, it is just as much of a treat for those who aren’t. For many players, the best part about this game is that the demo version starts them out with an extremely large bank roll that allows them to explore everything the game has to offer without risking their own money to do so. If you like this game, you might want to check it out in the mobile casino version of the game from the platform NetEnt Touch. Have fun!